In August 2005 the nation watched as Hurricane Katrina pummelled the Gulf Coast. Residents did not just suffer the personal costs of a home that had been severely damaged or destroyed; frequently they also lost their entire neighbourhood and the social systems that under normal circumstances made their lives "work". Katrina raised the questions of whether and how communities could solve the complex social coordination problems catastrophic disaster poses, and what inhibits them from doing so? 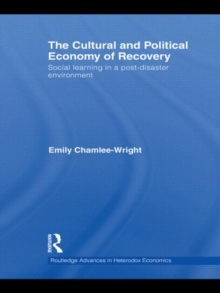 Professor Chamlee-Wright investigates not only the nature of post-disaster recovery, but the nature of the social order itself - how societies are able to achieve a level of complex social coordination that far exceeds our ability to design. By deploying the tools of both political economy and cultural economy, the book contributes to the bourgeoning literature on the social, political and economic impact of Hurricane Katrina. Through a selection of case studies, the author argues that post-disaster resilience depends crucially upon the discovery that unfolds within commercial and civil society. The book will be of particular interest to postgraduate students and researchers in economics, sociology and anthropology as well as disaster specialists.